In honor of Earth Day, local bloggers FoodieTots and Arugula Files have organized something they’re calling “Blog for the Bay.” It’s an effort to support clean water in the Chesapeake and to urge the EPA to move forward on Bay clean-up efforts. They’re also encouraging anyone who’s interested to sign the Chesapeake Bay Foundation’s petition. As part of the project, we here at Capital Spice are happy to share one of our favorite things about the Chesapeake: Chris’ Marketplace and their delicious crabcakes! If you’ve ever walked through the Dupont Circle or the Penn Quarter FreshFarm Market, chances are you’ve been drawn to Chris Hoge’s stand. It’s a simple setup – just a few tables and coolers with a pair of butane stoves and a dry-erase board – but it’s been known to draw lines of people queued up to enjoy some of Chris’ delicious seafood specialties. Chief among them are his jumbo lump crab cakes, made from Chesapeake Bay blue crabs. It should come as no surprise that Hoge knows what he’s doing: he captained a commercial fishing boat for a time before settling into his current role as a vendor of “value added seafood products.” With his connections to top-quality wholesalers and his knack for bringing out the natural flavors of his raw materials, his crabcakes (not to mention his shrimp refresco and his empanadas) put the competition to shame. There is a beating heart of Europe slapped in the middle of Georgetown: outdoor drinking, light entrees and elegant pastries are yours for the taking if you just know when to turn off M Street and head down a stone flight of stairs. The most tantalizing offering from Leopold’s Kafe is also the first thing you see: a lovely, sun-drenched courtyard. Dotted with friendly orange umbrellas, the stone courtyard is just far enough away from M Street’s hustle and bustle to feel like a real escape. The Austrian restuarant is hugged on three sides by Cady’s Alley, bordering a side street melange that only enhances the continental flavor with its upscale home design shops whose names require additional apostrophes. I skipped down the stairs from M St on a recent visit to find the courtyard full of merrymakers on a sunny post-work spring afternoon. The most notable table, perhaps, was the boisterous crowd of preppy Spanish speakers (staffers from nearby embassy?) who were clearly several rounds in to the happy hour. The inside of Leopold’s is crisp, modern and fairly uncomfortable looking. Luckily my friend Jean made arrived a few minutes early and snagged a coveted seat on the patio with the Spanish revelers. Generally speaking, alcoholic beverages and putting out fires are a bad combination when attempted simultaneously. But volunteer firefighter Rich Fleischer’s Hook & Ladder Brewing Company has found a much safer way to blend the two. Based in Silver Spring, the craft brewer and his team (including his brother and business partner, Matt) are turning out kegs and cases of beers with names like Backdraft Brown, Ember Amber and Lighter while supporting burn treatment facilities in the areas where their beers are sold. I had the opportunity to sample all of the above beers, as well as the Hook & Ladder Golden Lager, at our local Harris Teeter while shopping for Super Bowl supplies earlier this year. Although I may not be able to tell you the difference between cascade hops and two-row malt, I can certainly tell you that these craft brews made an impression. And when I heard about their “Penny in Every Pint” program, I was sold. Since then, I’ve picked up a six pack of the Backdraft Brown on several occasions, and it’s been a hit every time. A 1700s-era colonial tavern was uncovered by construction crews in Easton, MD. I guess their Kronenberg 1664 is the real deal. Pop Candy lets us know about two dudes who serenade Taco Bell. Eggs are so haute right now. Packaged food manufacturers like Campbell’s are moving away from sweepstakes and into cause marketing. Tacqueria Distrito Federal may be expanding to H St NE. Enology is starting a brunch service this weekend. Mark Bittman of the New York Times argues for more reality in cooking shows. Metrocurean shares that Todd English is no longer working with Cha. Sad news for Old Town diners… Farrah Olivia, the modern, experimental and all around fantastic restaurant is closing April 29th. Chef Morou Ouattara cites lease issues with the landlord. But all isn’t lost! According to Best Bites Blog, the team plans to re-open the restaurant in downtown DC and already has another effort in the works for a Crystal City location. Burger King is revamping advertisements airing in Europe for its Texican burger – only available across the pond – after a diplomat called them offensive and damaging to the image of Mexico. Good news for PX fans – According to Mr. Thrasher, the lounge will begin taking reservations online next week at EammonsDublinChipper.com. Endless Simmer tells us 100 ways to cook an egg featuring photos and recipes. Sun Chips are rolling out new compostable packaging. Ever thought about starting a vegetable garden in a sawed off whiskey barrel? That’s one badass garden. Check out these food and dining events in the area from DC Foodies. The poplation of blue crabs in the Chesapeake Bay is on the rise. Greek Easter is this Sunday. Here are some traditional recipes for the family feast. After what felt like months of lousy weather, we’ve finally got a stretch of decent days ahead of us. Here at Capital Spice, that means one thing: it’s time to pick out greenery for our planter boxes. Like most DC residents, we’re working with a pretty limited space when it comes to growing things. And unlike Robert Weland at Poste, we’re too lazy to turn our backyard into a makeshift garden. So what’s an aspiring locavore to do? Make use of the space you’ve got to grow the herbs you know you’ll be using anyway. When it comes to bang for your foodie buck, growing herbs is right up there with owning your own goat. In most grocery stores you’ll pay close to two dollars for a bunch of herbs – more for the good stuff like sage and thyme. And the petroleum-based plastic packaging that so many herbs come in adds exponentially to the environmental impact of your purchase. Rather than swearing off the green stuff altogether, why not try your hand at raising your favorites at home. Even if you live in an apartment with only one window, you’ve got room for a few herbs. And there are some that are so hardy that nothing short of a significant snowfall will kill them (we had so much rosemary that there may still be some living from last year). If you’re feeling agriculturally inclined, you can even go so far as to raise your herbs from seeds…but ideally you’d have already done that. We’re not especially good at raising plants, so we opt for the slightly easier approach: we buy the young herbs and then plant them. When it comes to comfort food, I’m still a Jersey boy at heart – give me a plate of pasta any day. Although the long corkscrews known as fusili lunghi are my favorite, I’m an equal opportunity eater when it comes to shapes. I’m not even particularly picky when it comes to toppings. I enjoy a good garlicky pesto; a simple toss with olive oil, parmesan and black pepper; and a nice tomato gravy (we don’t call it sauce where I come from) from time to time. It should come as no surprise, then, that I was struck by a feature in one of our foodie magazines (Everyday Food) highlighting soba. These buckwheat noodles are prevalent in Japanese cooking, whether served in soups, salads or on their own with a dipping sauce. Soba (and buckwheat in general) contain high quantities of cholesterol-lowering B-vitamins and rutin, an antioxidant. So we decided to give it a try. We found one recipe within the feature that caught our eye, a soba soup with shiitake and spinach. Looking through our cookbooks, we also found a recipe in John Ash’s “From the Earth to the Table” for Japanese-style grilled salmon with a cold soba noodle salad. We decided to check out both to experience soba in two very different ways. One of the recipes was a home run; the other, not so much. There are certain foods I am perpetually hungry for, even if I’m not hungry at all. All I need to hear is someone mention it and I’m interested. “Yeah,” I think, “that is just what I’m in the mood for!” Sushi is a big offender here, as are cookies. Any kind of cookie. And, to my chagrin, so is Chinese. Being hungry for Chinese in DC can be a disappointing experience. I have a few no-fail favorites like Peking Gourmet Inn and City Lights, but I’m always trying to add to the roster. 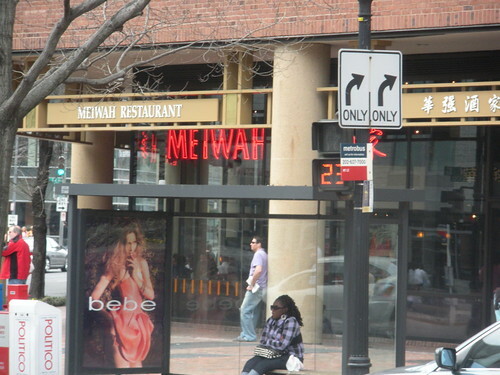 With all this in mind, its understandable why I jumped at the chance to try Meiwah on the DuPont Circle/Foggy Bottom borderline. Itty Bitty Bitter Betty has been raving about the place for years and I was excited to finally put it to the test and the end of a night of cocktailing with her and Nell. A few steps in the door and it was already difficult not to be impressed by Meiwah – the dining room is a two-story soaring megapolis of eaters and even at 10pm on a school night it was packed. The walls are filled with photos of the owner and famous faces (many of them are only famous to the most studied DC wonk, though. I had to check the caption on quite a few). Despite the crowd, we secured a table and within minutes we were seated with menus, water and a smiling waitress ready to take our appetizer order.